I succumbed. I finally did it. I got Pinterest. I'm not that big on social media, which is weird seeing I studied and worked in Marketing for so long. As much I agree Facebook and Twitter etc is great for businesses (not all though) and big corporations, the thought of me tweeting random crap and people having to waste their time reading it seems pointless. And even though I say this, yes I have a twitter account. I have never tweeted. I don't even remember my login details. I don't even remember the last time I logged in! Pinterest was one social media I never thought I'd get into. It would always pop up on my blog stats and I'd click and go "oh that's nice, some pinned my recipe!". But then recently, Pinterest blocked my ability to see this. I had to login. It got me thinking about Pinterest and why I avoided it for so long. So I joined, thinking if it's balls I'll delete it (yeah I said balls, and it's the balls you're thinking, correct). I had a look around, turned everything to private, and gasp, I pinned something! Pinterest told me I'm only allowed to have three private boards and even then people can kinda seem them. Ahhh screw it. If I'm going to do this I'm going to commit. 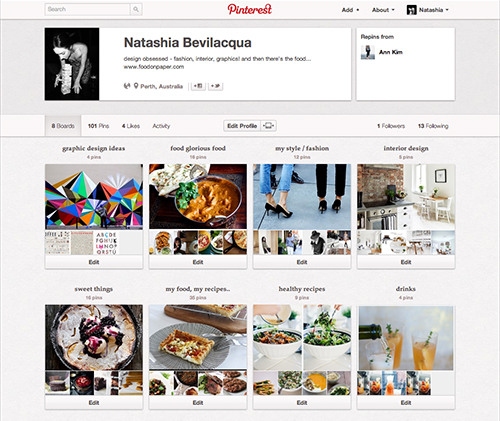 Hi, my name is Natashia Bevilacqua and I am a Pinterest addict. I thought there's no point in having this if I can share my pins (the idea still seems a little strange) and I pin off others - we're all here to get ideas after all! I've included my little button on the right (and below), and you can have a look and see if you'd like to follow me, or, whatever, stalk (we alllllll do it).